So, who has better claim? Here is Tampa's argument, from WUSF News Director Scott Finn. Miami is trying to steal the sandwich from Tampa. And yes, after the Cuban revolution, Miami became the undisputed capital of Cuban America. Cubans in Tampa have a different history. They came to Tampa a century ago to make cigars. They brought along their bread – with its crispy crust that breaks into a million crumbs, and its sweet, airy middle. In Tampa, Cubans quickly mixed with others – like Italians. Their Genoa salami is an ingredient that’s missing in the Miami version of the sandwich. Miami’s mayor might say, oddly, that salami belongs on pizza – but its salty greasiness is the perfect foil for mustard, pickle and Swiss cheese. 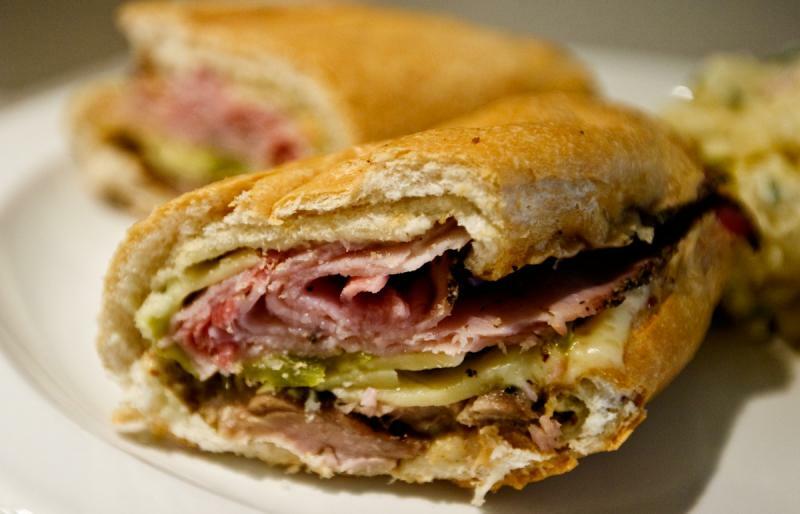 Tampa’s Cubans married those Italians, Spaniards and others and formed a pan-Latin community – and a pan-Latin sandwich. One more thing: Greater Miami is also home to Oneal Ron Morris, the unlicensed "doctor" arrested after allegedly injecting caulk and fix-a-flat tire sealant into the rear ends of her patients. What, you might ask, would drive people to a quack like Morris? Walk around South Beach in Miami and look at all the silicone-injected beauty, and you’ll feel so paranoid about your body you might be temped to do radical things. Just like the Cuban Sandwich. It’s not fancy, or beautiful. It grew out of the need for cigar workers in Tampa to have an affordable lunch. Miami can keep the haute cuisine and the plastic surgery. Give me white-sand beaches, a hot pressed Cuban sandwich, and a beer – in other words, Tampa!